I have been digging through the Lewisham Tree Data in order to try and discover some useful insights. The data published by the Council contains information on Ward, Geographic Location (Easting / Northing), Age, Condition & Height but unfortunately contains nothing about ‘where’ the tree is located, e.g. whether the tree is in a park or cemetery, on a street or in another Council owned location. As this campaign is concerned primarily with street trees my first step was to enrich the data to include these categories. To analyse and present the data I am using an excellent tool called CartoDB which allows location data to be imported, queried & mapped. In order to allocate the different categories (Park Trees, Street Trees, Other) I imported the Lewisham Tree Data as well as ‘shapefiles’ containing London’s parks, recreational areas & roads (available via OpenStreetMap). 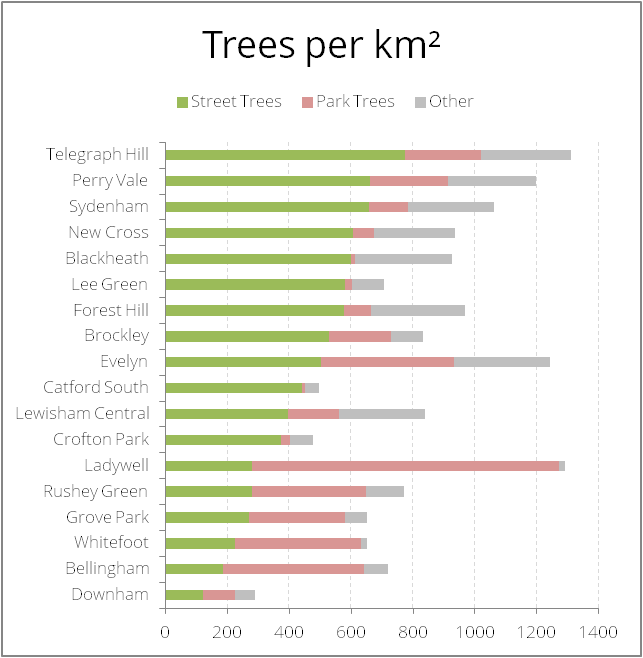 As shown, Downham is at the bottom of the list for ‘Tree Count’, ‘Tree Count per km²’ and ‘Street Trees per km²’. Rushey Green and Catford South are doing slightly better but are still in the bottom half of the table, with almost 1/3 and 1/2 as many street trees as the top of the list, Telegraph Hill. I’m uncertain if ‘Street Trees per area’ gives the best measure to compare the different wards therefore I am going to keep digging into this dataset to see what other insights I can find – more to follow. Next > Catford Is Changing!